1. A three-motor system for the control of complete machine, with five-motor and seven-motor system as options. 2. Automatic computerized color register system and static detection menu. 3. Built-in double arms dual-station whirling stand for rolling and unrolling to receive materials without machine halt. 4. Variable frequency motor for the control of main engine, traction and rolling. 5. Automatic tension control for unrolling and two variable frequency motors for rolling. 6. Shaftless air-ejection printing plate, backpressure pneumatic scraper and dual cylinder swing arm type roller in the printing part. 7. Sealed hot air oven for external heating, hot air circulation and automatic control of constant temperature. 9. Driven by high-precision gear box with patented technology. 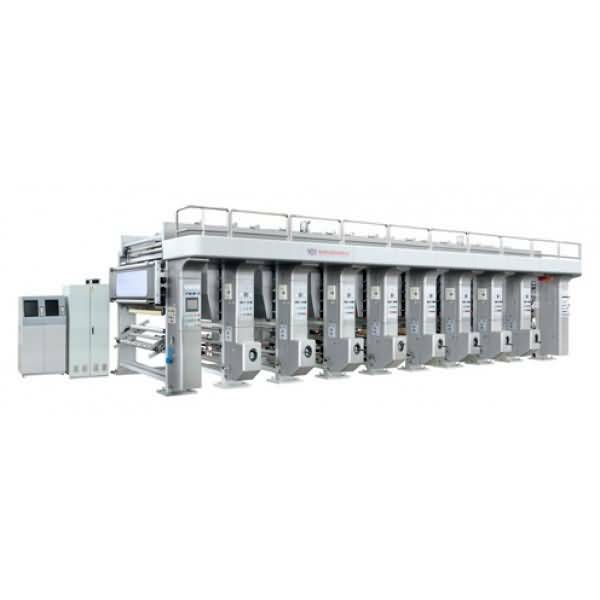 Established in the early 1980’s, our company is one of manufacturers pioneering the specialized production of complete equipment of flexible package printing. We mainly produce various kinds of high-, medium-, and low-end color printing machine, lamination machine, slitting machine and bag-making machine, with reliable quality, great reputation, wide user recognition and increasing market share. In particular, our newly launched QDASY full automatic computerized color register machine is recommended by France Quality Supervision and Evaluation Committee as the high-quality technology product for its easy operation, exact overprint, and stable run. In addition, with the great efforts of many technicians engaged, our company focuses on the introduction of yew paper printing machine, yew paper bronzing machine, yew paper slitting machine and other equipment. Guided by acute and creative management idea, our company has imported advanced modern technical devices and applied scientific management to allow full play to enterprise technology and personnel advantage, constantly adjust the product structure to an economic scale and implement high-level, comprehensive and diversified business development strategy.We have successfully established product marketing network adapted to market economy, which lays a solid foundation for the enterprise development. Abiding by the “science and technology in the lead, quality first and user foremost” principle, we supply customers with not only high quality products but also all round technology consultation and after-sale service to integrate product sale with technology service organically and create great economic benefits to clients. In the process of growing and developing for decades, we have established firm relation with extensive customers in good faith and based on mutual understanding for common benefit and prosperity. In the future, we will continue to serve as the most sincere friends of customers to always help them out for their sake.